Download the The National Flood Mapping Program Placemat. In 1968, Congress created the NFIP to provide a means for property owners to protect themselves financially from flood events. The NFIP offers flood insurance to homeowners, renters and business owners if their community participates in the NFIP. Participating communities agree to adopt and enforce floodplain management ordinances that meet or exceed FEMA requirements. The Stafford Act constitutes the statutory authority for most Federal disaster response activities especially as they pertain to FEMA and FEMA programs. FEMA, through its Office of Chief Counsel, has produced an updated electronic version of the Stafford Act. Download the Stafford Act, stafford_act_booklet_04 22 13. Some highlights and new features: Contains all changes to the Stafford Act since 2007, including the Sandy Recovery Improvement Act (SRIA) of 2013. The document is optimized for portable tablet devices: From the Table of Contents, you can click on the statute name or number and you’ll jump to the statutory text. The National Flood Insurance Program (NFIP) is a voluntary program based on a mutual agreement between the federal government and the local community. In exchange for adopting and enforcing a local floodplain management ordinance, federally backed flood insurance is made available to all property owners throughout the community. The Division of Water (DOW) is the state’s coordinating agency for the NFIP. In this role, the DOW establishes development and building standards, provides technical assistance to communities & agencies, and evaluates & documents community floodplain management activities. Link here for a NFIP Fact Sheet. Federal disaster assistance is usually a loan that must be paid back with interest. For a $50,000 loan at 4% interest, your monthly payment would be around $240 a month ($2,880 a year) for 30 years. Compare that to the average flood insurance policy, which is about $650 per year, or about $54 per month. Even though flood insurance isn’t federally required, anyone can be financially vulnerable to floods. In fact, people outside of mapped high-risk flood areas file nearly 25% of all NFIP flood insurance claims and receive one-third of Federal Disaster Assistance for flooding. This booklet is intended to acquaint the public with the NFIP. Despite the highly technical nature of the Program, there has been a deliberate effort to minimize the use of technical terms. This publication is designed for readers who do not need a detailed history or refined technical or legal explanations, but do need a basic understanding of the program and the answers to some frequently asked questions. Click NFIP Question & Answer to download the publication. Responsibility for flood loss reduction is shared by all units of government— local, state and federal—and the private sector. Fulfilling this responsibility depends on having the knowledge and skills to plan and implement needed floodplain management measures. The fundamental floodplain management program that most others are built on is the NFIP. Certain activities (e.g., floodproofing design, survey of building elevations, hydrologic and hydraulic analyses, survey and topographic data) require certification by a licensed professional architect, engineer, surveyor, or the community floodplain administrator. 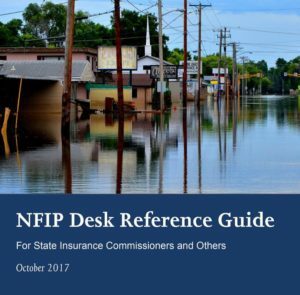 FEMA updated its “NFIP Desk Reference Guide for State Insurance Commissioners and Others.” The guide is in three distinct parts: Before the Flood, During the Flood and After the Flood. Each provides valuable resources on what you need to know, what you need to share with policyholders and property owners, and who to contact. It’s organized to provide you the information you need to know when you need to know it most. FEMA published it electronically to ensure easy updates as the program evolves, and also included an interactive version. Have you visited FloodSmart’s consumer or agent websites lately? Both sites have been expanding over the last few years, offering new and improved resources for groups who often play a critical role in helping homeowners understand, and address, their flood risk with insurance protection. From an entirely new section of FloodSmart.gov housing outreach tools for stakeholders to a helpful new guide that agents can take into the field after an event, both sites are evolving to provide more tools and resources to support NFIP partners who connect consumers to flood insurance. FloodSmart has resources for stakeholders and communities that want to go the extra mile to help property owners better understand their flood risk and the financial impact of flooding. FloodSmart.gov provides sharable tools for communicating the risks, causes, and costs of flooding and a wealth of information about how to empower local residents to obtain flood insurance policies. Resources on the page include interactive tools showing flood risks and the cost of flooding; toolkits with materials to support your work around flood outreach, flood map changes, and levees; videos showing the devastation caused by flooding; and embeddable widgets highlighting specific flood risks. Agents.FloodSmart.gov has a new guide to help insurance agents promote the importance of flood insurance to their customers. The guide includes a wealth of tips on how to explain flood risks, talking points that can be useful in telephone conversations and in-person client and prospect meetings, “barrier buster” messages that can help you overcome resistance to purchasing a policy, and much more. Please visit www.FloodSmart.gov to see what is new and exciting for agents, real estate professionals, lenders, and community officials. Designed for real estate professionals, this brochure provides answers to the following questions: Why should I alert my clients about the importance of purchasing flood insurance? Who can purchase flood insurance? How do clients obtain a flood insurance policy? How much will it cost? When is the best time to buy? SFHA is a special flood hazard area? When property owners receive financial assistance from the Federal Government following a Presidentially declared disaster, they may be required to purchase flood insurance coverage. NFIP Community Rating System – Access a full description of the NFIP Community Rating System with information about the benefits of the CRS and how to join. Also link to CRS Updates & Newsletters. The NFIP provides a wealth of information that can strengthen residents understanding of flood-related issues, including how to prepare for floods, how to obtain financial protection against flood damage, and what to do after a flood disaster. FEMA periodically issues WYO Program Bulletins related to recent legislative changes and clarifications to the NFIP Flood Insurance Manual. The bulletins are posted at http://www.nfipiservice.com/nfip_docs.html. Have questions, contact us at help@kymitigation.org. Don’t forget to join the KAMM group on Facebook and LinkedIn.